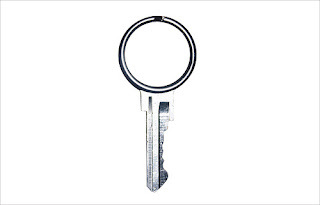 Keyring Key - Sure, why not? 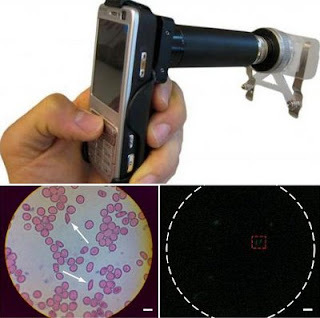 Want one less piece of metal jangling around in your pocket? Get one of these keys from Amron Experimental and ditch the keyring. It's one of those ideas that's so good it makes you feel stupid for not having thought of it. Sure, there are problems: that becomes the one key you can't remove from the others without causing a mess, there may be practical metal-strength problems, and so on. But just look at it, and tell me it doesn't feel right! Not bad. 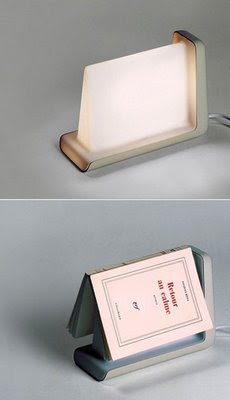 I've posted about something similar before, but this latest concept from designers Jun Yasumoto, Alban Le Henry, Olivier Pigasse, and Vincent Vandenbrouck (wow, that's a lot of credits) adds one more feature to the list: it's (1) a reading lamp that (2) serves as a bookmark, and (3) is turned on and off by the book itself. Yup, placing the book onto the wedge of light saves the page and turns the light off in one fell swoop; picking the book back up turns the light on. 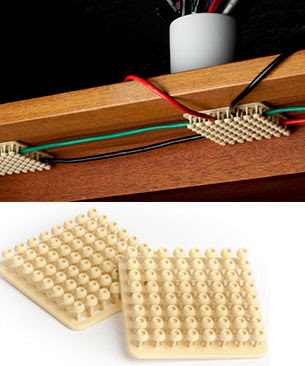 Simple, functional, and even intuitive - for the limited real estate on one's nightstand, that's not a bad combo! 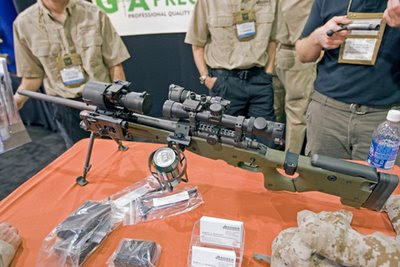 Sniper Rifle Cup Holder - Deadly and refreshing! Pete Kazanjy, a friend who's such a frequent contributor that he should almost be listed as a co-author of this blog, has another gem for us. Remember the simple and practical double shower-curtain rod, with an extra bar for towels or clothes? Well, Pete spotted one for sale out in the wild - but with a photo on the packaging that gets it all wrong. 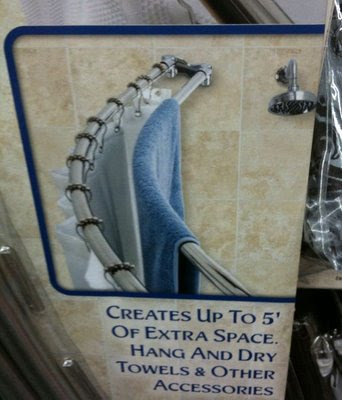 The towel is hanging inside the shower curtain, dooming it to become soaked during the shower instead of drying you after it. Maybe this just makes a more attractively composed product photo - or maybe the photo crew didn't give a hoot - but it's just a bit sad. The bright side is that it would take a real user just one shower to discover their error! Laptop Notification Light - Why isn't this a real feature? 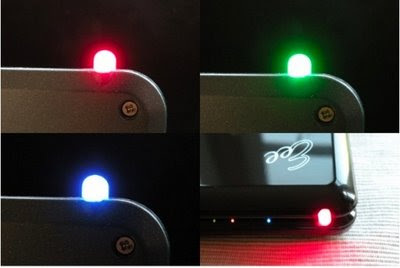 The image at left is a hacked, home-built feature added to a standard netbook, but it's pretty darn brilliant: a single tri-color LED, visible at all times (even when the laptop is closed) illuminates in different colors depending on whether there's activity on the user's email, IM, Twitter, or whatever. My question is, in an age of constant connectedness and instant updates, why isn't this a real product feature being offered by PC makers? Of all the lights that are visible on a laptop - power, hard drive access, wireless, bluetooth - why couldn't one be something just like this? It adds value, it would be cheap to implement, and could be as easy to use (for beginners) or customizable (for power users) as the owner wants. C'mon, PC makers, pick this up! 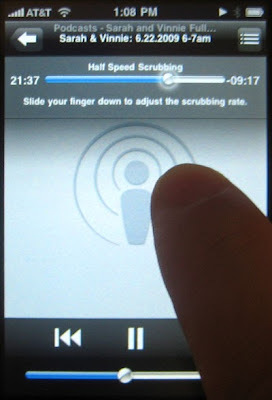 Fellow usability blogger Jasper posts on his Uselog site about how mobile web devices (yeah, iPhones) are throwing a wrench into normal social interactions. Good old-fashioned conversational delights give way to whipping out the phone to look up some fact, photo, or video; or worse, those present decide that their company is less interesting than texting those absent. 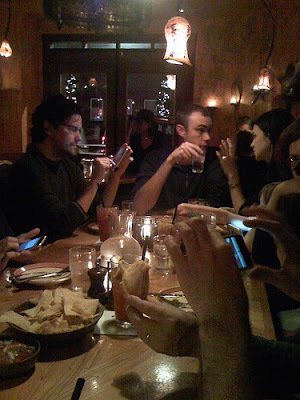 He also found this photo, from Flickr user garrettmurray, showing no fewer than five iPhones in use at an (otherwise) fun social gathering. Maybe some of the fun in conversation, what makes it work, is not knowing the answers immediately by looking them up, but instead talking about and debating them... Something to think about, or laugh at, either way! Spaghetti Measure: Neat, but why not get a scale? 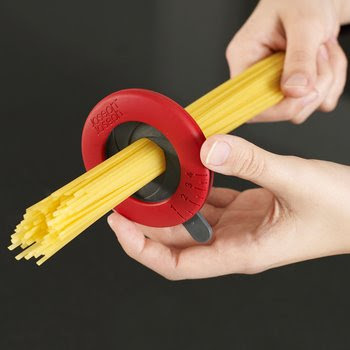 This aperture-sporting little gadget is Joseph Joseph's Spaghetti Measure, which quantifies your pre-cooked noodles by cross-sectional area. It's cute, and visually compelling, and has the guise of usefulness - but how useful is it, really? I can think of a few problems: the "serving size" numbers are arbitrary and can't seem to be translated to standard units; the measurement depends on spaghetti of a certain diameter and length to be consistent; and worst of all, this is a one-trick wonder that only works on spaghetti noodles, not any others! If you're going to get a truly useful pasta-measuring gadget, find a lightweight kitchen scale; it's good for pasta of all shapes and sizes, and other small measurables as well. It may lack the cuteness factor, but I wager it'll serve you better for years.